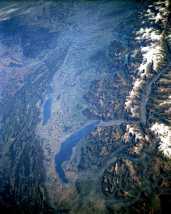 On Monday, October 10th, 1994 astronauts on board the United States Space Shuttle Orbiter Endeavour , on the next to last day of mission STS-68 took this picture while passing over Western Switzerland. The centre of the photo is at 46.5° North latitude, 7° East longitude, not far from the location of the www.fourmilab.ch server. At the time the shot was taken, 10:12:05 Universal Time (GMT), the shuttle was passing over 44.1° North, 5.3° East at an altitude of 204 kilometres. The view is to the northeast, with the Sun at an elevation of 37° above the horizon at the shuttle's location at an azimuth of 157° measured from the North. A 250 millimetre lens was used on the camera; the photograph is catalogued as frame 133 on roll 168. At the time of the photograph, skies over the area were almost cloudless (unusual for that time of the year). The original image has been processed to compensate for low-lying haze and enhance the visibility of features on the ground. Lac Léman (Lake Geneva) is at the bottom of the image, with the three-lakes region (Lac Neuchâtel, Lac de Morat, and the Bieler See) are toward the left centre. To the left of the three lakes are the Jura mountains, through which the French/Swiss border runs. The Alps are at the right of the the image, with the deep glacier-cut valleys clearly visible. The principal cities of western Switzerland lie on the plateau between the Jura and the Alps, which lies at an altitude of about 400 metres. This and many other superb high-resolution images takes by astronauts on on Shuttle missions may be browsed and downloaded from the NASA Earth from Space image gallery. Feature: "JURA MTS, L. GENEVA, ALPS"
STS068-168-133 Lake Geneva, Bernese Alps, and Jura Mountains, France and Switzerland October 1994 This spectacular, northeast-looking, low-oblique photograph reveals Lake Geneva and the elongated valley between the Jura Mountains of France and the high Bernese Alps of Switzerland. Crescent-shaped Lake Geneva, 45 miles (70 kilometers) long, is noted for its deep-blue, remarkably transparent waters and seiches, tidal fluctuations that suddenly change the lake's water level. The Rhone River enters the lake from the Bernese Alps to the east and exits the lake at its south end through the city of Geneva. North and west of Lake Geneva are the Jura Mountains (visible along the northern edge of the photograph) that extend in northeast-southwest, narrow, parallel ridges. Their rounded crests and summits are covered with pine forests and good pasturelands. Hydroelectric plants scattered throughout the mountains supply power to pulp and paper, textile, watchmaking, and woodworking industries. The Jura Mountains are a popular year-round resort area. East of Lake Geneva are the snow-capped Bernese Alps (visible along the eastern edge of the photograph) that afford some of the finest winter sports and mountaineering terrain in the world. The Bernese Alps, consisting primarily of granite and metamorphic rocks that are extremely resistant to erosion, have an overlay of sedimentary formations that have buckled up and folded. Subsequently scoured by glaciers, the mountains are now marked by deep valleys, knife-edged ridges, and steep walls that rise abruptly from lower slopes. Surrounded by vineyards northeast of Lake Geneva is Neuchâtel, an elongated lake 24 miles (39 kilometers) long and 4 to 5 miles (6 to 8 kilometers) wide.